"Didn't have enough Jalapenos to make full out poppers, but improvised for a creamy and spicy appetizer. You'll want to eat them right away, but they will be molten hot so be careful!" Preheat an oven to 350 degrees F (175 degrees C). 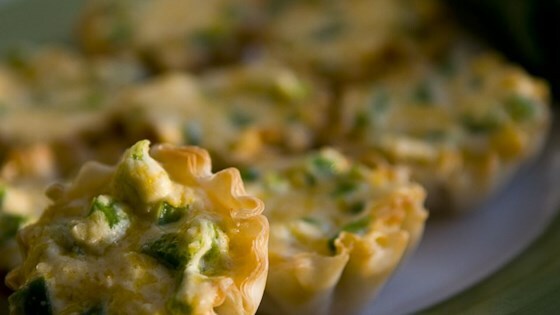 Place phyllo cups onto a baking sheet. Stir together cream cheese, Cheddar cheese, jalapenos, and hot sauce in a bowl. Spoon mixture into phyllo cups. Sprinkle bacon bits on top. Bake in preheated oven until golden brown, about 15 to 20 minutes. Serve warm. I took the suggestion of using individual tortilla chips. I used Tostitos scoops. They were perfect . BIG HIT!!!!!!!!!!! I put the mix in a sandwhich baggy and snipped the cornor to pipe the mix in to make it easier and so that I wouldnt break the shells.